The fascinating story of the most powerful source of energy the earth can yieldUranium is a common element in the earth-s crust and the only naturally occurring mineral with the power to end all life on the planet. After World War II, it reshaped the global order-whoever could master uranium could master the world.Marie Curie gave us hope that uranium would be a miracle panacea, but the Manhattan Project gave us reason to believe that civilization would end with apocalypse. Slave labor camps in Africa and Eastern Europe were built around mine shafts and America would knowingly send more than six hundred uranium miners to their graves in the name of national security.Fortunes have been made from this yellow dirt; massive energy grids have been run from it. Fear of it panicked the American people into supporting a questionable war with Iraq and its specter threatens to create another conflict in Iran. Now, some are hoping it can help avoid a global warming catastrophe.In Uranium, Tom Zoellner takes readers around the globe in this intriguing look at the mineral that can sustain life or destroy it. For those looking for a book that explores the potential of nuclear energy, this book is a complete waste of time. It is subtitled: "War, Energy, and the Rock That Shaped the World," but energy is given very short shrift and there's no detail. Even the last chapter's nominal focus on the reborn promise of nuclear energy's potential to help cure our society of oil dependency and pollution can't stay on track. The author repeatedly digresses to what really interests him: the geopolitics of uranium, or at least his version of them. I still find it hard to believe that anyone could write a 300-page book about uranium and include repeated teases about its use as an energy source, yet not discuss nuclear submarines or nuclear propulsion, Yucca Mountain, or breeder reactors (or the U.S. ban on building breeder reactors, obviously). So what does author Tom Zoellner include to make up for these omissions? What you might call an eclectic mix of alternate subjects, if you were being kind. I was feeling less than kind after wasting several hours reading Zoellner instead toss into the mix: Zoroaster, Bob Hope, Brigham Young, Joan Didion, and of course Dagwood Bumstead. The author jumps all over the place. Geographically, as well. He starts a chapter in Yemen, using that county's plans to start a nuclear industry as a springboard for Zoellner to more thoroughly examine the pros and cons of nuclear energy. Or so I assumed, wrongly. No, after some socializing in Yemen we're off to New Mexico for a few pages, then Kentucky, then Vancouver, then Mongolia. Four to five pages on any one scene is about all he can handle; he writes in 1500-word arcs or so and shifts the action abruptly when his attention begins to wane. And I use the words "scene" and "action" deliberately - one reviewer inadvertently referred to the book as a novel, and I understand what put that thought into his/her head. It's not a novel, or a novelized version of real-life events, but its style is definitely closer to that which is common in fiction than what we usually encounter in science books. What I consistently found most disturbing about Uranium as I was reading it was what it had to say about human nature. The author doesn't take a political stand one way or the other, which I think really serves the book. Instead, he provides historical background about the discovery of uranium and the way that discovery has shaped our world since. I found it to be a very neutral account for the most part. Yet for me, even that neutral tone couldn't hide the horror of the realization of the brutalities and atrocities carried out by the governments of a wide variety of nations, all in the interest of procuring as much uranium as possible. It's truly stunning to realize just how indifferent humans can be to the plights of others when they're blinded by greed. There is a provocative central question to this book: Has uranium actually made our world safer or more dangerous? The heads of state of most nations seem to think that the nuclear threat isn't all that real because no one in their right mind would drop a bomb on another nation as that nation would retaliate by dropping a bomb in return. This idea of mutually assured destruction apparently helps some people sleep at night but it's really a rationalization. Zoellner addresses this issue when he writes about the possibility of terrorists or rogue nations obtaining nuclear weapons. When you're talking about people who have no real respect for human life or people whose ideology leads them to think obsessively about the end of the world, can you really expect that the idea of mutually assured destruction will prove an adequate deterrent? What is also disturbing about this novel is the many ways in which uranium has been used against people. It goes without saying that the United States' dropping of hydrogen bombs in Japan during WWII is the most dramatic example of this. And, yet, Zoellner points out the ways in which Africans in the Congo were forced into slave labor in harsh conditions with even harsher punishment and the way the former Soviet Union later utilized similar practices during the Cold War arms race. Zoellner writes about those who have been exposed to radiation in the air, soil, and water due to byproducts of the mines, as well as the health effects on the scientists, miners (paid and unpaid), and employees of processing plants--especially before the effects of radiation were fully understood. When all of these factors together are added up, the toll on human life has been more or less incalculable--and this, of course, does not even begin to address the toll on the environment. While the production of nuclear energy doesn't produce greenhouse gases, it does produce toxic waste and that has to be disposed of somewhere. I think that Tom Zoellner presented a fantastic, well written, account of uranium. 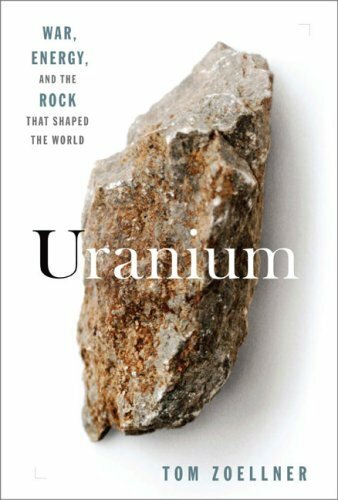 The book dives into, in great detail, the vast history of uranium including: The element, The mineral, and possible future uses. I would highly recommend this book to anyone the is into physics and geology, as well as historians. I enjoyed reading this book very much. Forget the comparisons to pop histories about cod, salt, dictionaries, potatoes, or even the color blue. This book doesn't elevate an obscure or minor subject with the ersatz claim that it "changed the world." No--in point of fact, uranium really DID change the world, and continues to exert enormous influence. For once, we have a subtitle that really means what it says, and this book tells that story. This is an extremely interesting read! Did you know that the critical last part of the uranium that went into the Hiroshima bomb was intended as a gift to the Japanese military from the Nazis?? The materiel was on its way to Japan in a German U-boat when the captain received word of the Allied victory in Europe and decided to change course to New York, surrendering to the Americans. Two Japanese officers onboard committed suicide before the submarine docked. I can't believe I never heard of this!! As a nuclear submarine officer I deal with the reality of Uranium almost everyday. While I have been trained in many of the esoteric and highly technical facets of nuclear power, I knew little of the rocks history. This book is one I will be recommending to everyone I work with to learn the real story behind this powerful element. As a previous reviewer mentioned this is not something that will bore you with equations and gory details of nuclear fission, but it will give you some basic idea of how the energy is harnassed from Uranium. It's main emphasis however is on the story behind the how various countries acquired the technology to process uranium and what they have used it for. It's most fascinating story is of course the production of the atomic bombs that were dropped on Japan and the reaction of the various scientists that were involved. After witnessing the Trinity test in the New Mexico desert, JR Oppenheimer famously proclaimed, "I have become death, the destroyer of worlds."